Splashing about in a bird bath - this baby owl looks to be having the time of its life. Captured on camera in America, the fluffy wide-eyed creature was filmed by a staff member at WildCareOklahoma having a wash in a dog bowl. In the clip it shakes its wings from side to side before looking down and burying its head into the water every so often. After a little while it stops to take a breather and looks about the room curiously - as well as in the direction of another bathing owl. The pair then look at each other briefly before the main owl stares up at the video maker with very wide eyes.WildCareOklahoma is a temporary safe haven for animals struggling to survive in the great outdoors. After being nursed back to full health, the organisation release the animals back into the wild. 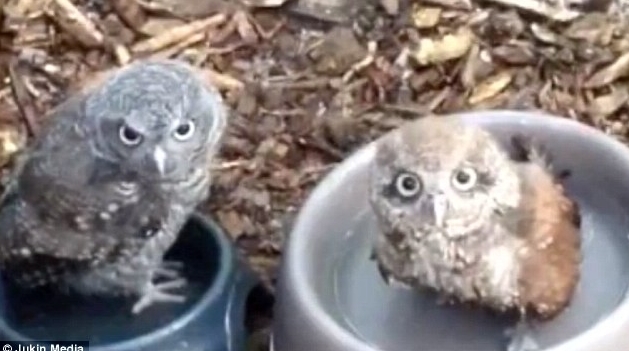 Responses to "Adorable Baby Owls Splashing Around In A Bird Bath"